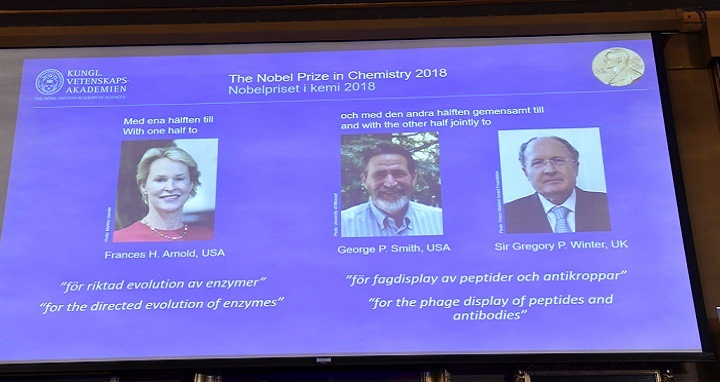 The 2018 Nobel Prize laureates for Chemistry are shown on the screen from left, Frances H Arnold of the US, George P Smith of the US, and Gregory P Winter of Britain, during the announcement at the Royal Swedish Academy of Sciences in Stockholm, Tuesday Oct. 3, 2018. Dhaka, 3 October, Abnews: The Nobel Prize in chemistry has been awarded to two researchers in the United States and one in Britain. The other half of the prize will be shared by George Smith of the University of Missouri and Gregory Winter of the MRC Laboratory in Cambridge. They were honored for "phage display of peptides and antibodies."